The original Forester design sought to stuff an SUV into downscaled packaging more palatable to the food co-op set. The 2009 model abandons its predecessors' upright, boxy vibe for something closer to a streamlined crossover approach. Sleeker, yet still oozing functionality. And, of course, the STI-like hood scoop on the turbocharged trim level just hollers "Subaru." Some aspects of the interior, such as the available perforated leather seats and the enlarged moon roof, are quite nice. It's just that the brushed aluminum-look interior details come off as far more flash than rugged, echoing the chromed tailpipes outside. The center console controls are easy to understand, as is the speedo-tach cluster, despite its weird anime color scheme. Overall, the interior feels drivable in that Subaru way, without compromising on spaciousness or cargo capacity, which is considerable. Here, the 2.5-liter, four-cylinder boxer turbo, making 224HP with 226 lb.-ft. of torque, is the name 'o the game. You get it on the Forester 2.5XT, and it serves up pretty smooth speed on the freeway, while still providing a lot of dynamic versatility under less-than-ideal road conditions—like ripping up a steep grade composed mainly of lose rocks and dirt. Engine tone is a subdued buzz, an alto ...rrrRRRR!!! that reminds you of the car's power without rattling your ears. I didn't get a whole lot of turbo lag. Abundant torque is at your fingertips. Pretty much ideal for the honing soccer mom who likes a quiver in the loins or the randy suburban dad who still enjoys a little Metallica from time to time. Very assured, with 4-wheel ABS plus brake assist. In lousy road conditions, you really appreciate the orchestration of the braking tech with the AWD, because it actually allows you to drive the car without resorting to tentative techniques. 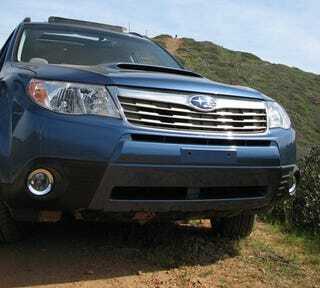 Even on rough roads, if you can manage the Forester's speed, braking can be limited to gentles inputs. However, when you need to stop, Forester stops you. One of this vehicle's best systems. This is not a minivan. This is not a luxury sedan. However, this is not an STI, either. Generally speaking, the ride is compliant, but you can still tell you're in some kind of utility vehicle. Subaru's new DC3 suspension layout definitely comes into its own when you get off the beaten path, however. Truth be told, this could be construed as a flaw—most owners will never experience not having their head banged into the roof as they traverse a small gully. Rally-esque on crappy roads, well-defined on regular roads and the freeway. If you're looking for a hauler that can carry a few kids and still deliver some thrills while dashing around old logging trails, the Forester is your baby. The combo of AWD, weight-distribution, center-of-gravity, and crisp steering (and a particularly well-designed steering wheel) yields a vehicle that can literally run circles around the competition. To get better, you'd have to go BMW. You have a choice between a 4-speed auto and a 5-speed manual. For this category, the vast majority of customers will go for the auto, which can be switched to sport mode. Shifts are smooth and unobtrusive under everyday driving conditions. When the going gets rougher, the 4-speed gets along very nicely with the turbo and the AWD, delivering a sense of great control. Yes, a 5-speed auto would be better. Probably. An extra star has been added for the availability of the manual gearbox, thank you Subaru for giving us the choice. You can fly either XM or Sirius on the system, which is operated off a display screen in the center console. The upmarket option pumps 80 watts through six speakers and can accommodate six CDs in-dash as well as MP3/WAA. Sounded great to me, but take that with a grain of salt as I dig the Cool Jazz. Not that many. If there's an Achilles Heel, this is it. Only the 2.5XT Limited and the L.L. Bean Edition have the optional in-dash nav system. So obviously, if you're like most folks in the Forester demo and you don't go for either of those trim levels, you'll be looking at aftermarket GPS. Hell, you can get the base model for $1200 less than the $21,195 '08 version, according to Subaru. Once you move up to the 2.5XT, you're looking at something in the $26-27K range, depending on options. If you don't need luxury or a lot of gadgets and a 5-speed auto, you'll be hard pressed to do better. Not a perfect update to Subaru's most versatile vehicle—for many, the flagship of the brand—but a definite improvement that serves up outstanding value while coming off as more capable than the competition when the going gets rugged. Should expand the demo and appeal to a younger customer without sacrificing Subaru's legendary character.